in colder than usual water temperatures. This was confirmed by a number of pupils, and staff, during the Pico sailing activity! The Windermere Trip is always eagerly anticipated by the pupils, as it is their last Junior School residential and a chance for them to try new outdoor adventurous activities and push themselves beyond their ‘comfort zone’. of the team carrying out different roles such as: chief belayer, bucket monkey and cheerleader. A popular activity was the exhilarating king swing, where the children were hoisted into the air by their team mates then had to unclip themselves and swing over a cliff face. less than four attempts to make his bed, not mentioning any names ... Wilko! 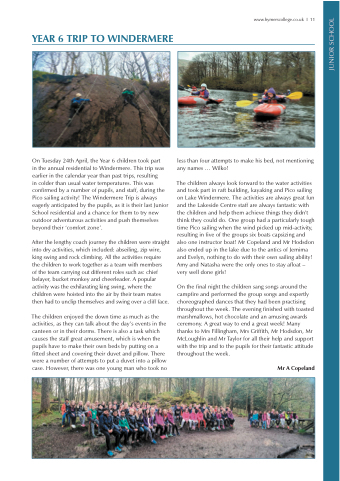 The children always look forward to the water activities and took part in raft building, kayaking and Pico sailing on Lake Windermere. The activities are always great fun and the Lakeside Centre staff are always fantastic with the children and help them achieve things they didn’t think they could do. One group had a particularly tough time Pico sailing when the wind picked up mid-activity, resulting in five of the groups six boats capsizing and also one instructor boat! Mr Copeland and Mr Hodsdon also ended up in the lake due to the antics of Jemima and Evelyn, nothing to do with their own sailing ability! Amy and Natasha were the only ones to stay afloat – very well done girls! On the final night the children sang songs around the campfire and performed the group songs and expertly choreographed dances that they had been practising throughout the week. The evening finished with toasted marshmallows, hot chocolate and an amusing awards ceremony. A great way to end a great week! Many thanks to Mrs Fillingham, Mrs Griffith, Mr Hodsdon, Mr McLoughlin and Mr Taylor for all their help and support with the trip and to the pupils for their fantastic attitude throughout the week.